If you’re like me and tend to carry the entire inventory of your local CVS in your handbag, then you understand the dilemmas and struggles of buying a mini, micro or any other small-sized bag. Handbags are shrinking left and right, and it seems like a another half dozen popular designs get miniaturized every season. In this edition of What Fits, I tested one of Christian Louboutin‘s standout micro creations, the Sweet Charity Fringes. The Sweet Charity is one of Louboutin’s popular handbag designs, and for fall, the smallest version of the bag got a makeover with a colossal amount of shimmering fringe. 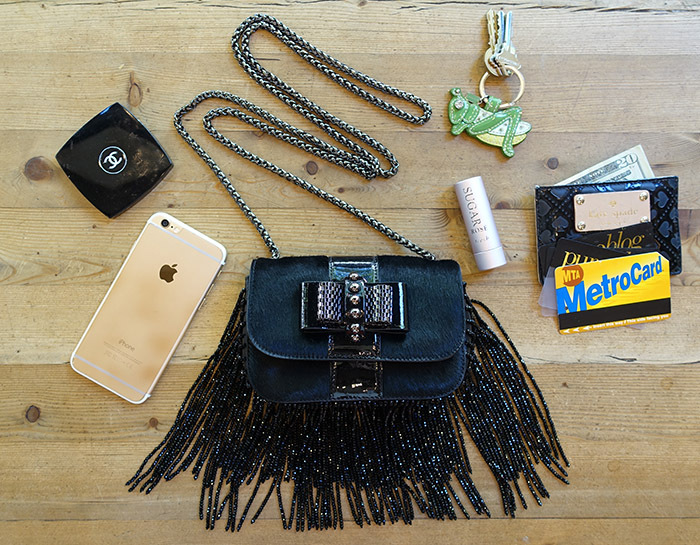 Surprisingly, this Sweet Charity measures slightly smaller than the Fendi Micro Peekaboo, with dimensions of 6″W x 4″H x 2″D and a 26″ chain strap (the Peekaboo measures 6″W x 4 ½”H x 2″D). This bag is indeed micro, but the statement it makes is anything but. Buy your own Sweet Charity Fringes through Neiman Marcus for $1,695.